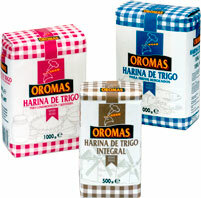 Capacity and experience over the entire durum wheat/semolina/pasta chain and over the common wheat/flours chain, allowing OROMAS to offer maximum quality and the best price. Our facilities, located in grain production areas, guarantee optimal logistics and the greatest competitiveness. Additional value for customers and consumers. OROMAS boasts the best technology (2013). Daily manufacturing capacity of 420 t of pasta. Daily packaging capacity of 400 t of flours and wheat semolinas. 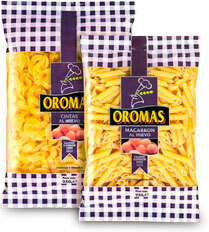 Versatility to produce all types of pastas and flours. Diversity and resources to package any product with the desired presentation and format. 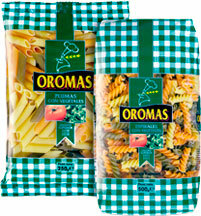 OROMAS, superior quality pasta and the most appropriate flours and semolinas for each final use. Good, natural, healthy and safe products. Integral quality assurance: ISO 9001, ISO 14001, OHSAS 18001 and IFS. We carry out any projects that are required, in search of new products, varieties, types and presentations. In-house department of experts in national and international logistics. Rigorous, secure and on time. In each case, OROMAS uses the most efficient mode of transport... and the most effective. We deal with all types of overland and maritime transport. We distribute more than 800 t, every day.